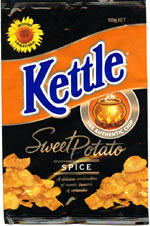 Taste test: Kettle Chips have decided to branch out into sweet potato chips, and I have to say I am pleased they did! Although an unusual taste, these are actually pretty addictive. The "spicy" flavour is probably better described as tangy, but is very delicious anyway. They claim it is a blend of cumin, tumeric and coriander, and the combination works well. I hope these chips are here to stay! Smell test: A light, tangy aroma with faint hints of roasted sweet potato.